Check out these cute play tents. Great for imaginative play! Would be cute Christmas or Birthday gifts! Currently ONLY $10! on walmart.com SAVE $19.97! 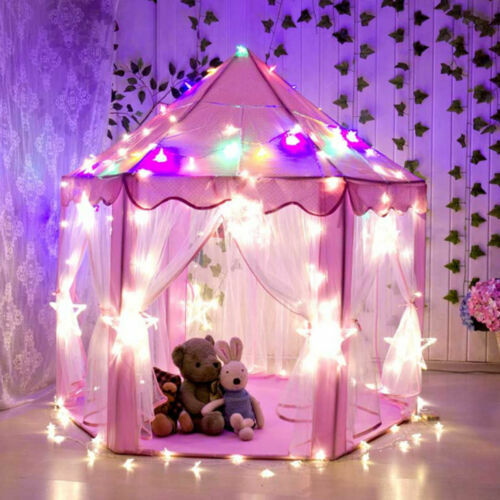 Your young princess will have hours of fun in the Sofias Magical World play tent from Playhut Inc.! The bookshelf can be used for light weight toys or books or remove to reveal secret passageway. Sofia's Magical World pops up in seconds for EZ play, and folds back up for EZ storage and travel with Playhut's patented Twist N' Fold Technology. Ideal for children ages three and up. Just twist, fold and store! With the Finding Dory Explore 'N Play tent, your child can enjoy hours of physically and mentally stimulating playtime in a fun aquatic world. It features a ball pit with fifteen play balls and a double-sided tent that small children can crawl through to play inside. This tent sports pictures of all of your child's favorite characters from the hit movie, Finding Dory. Its patented Twist 'N Fold technology allows it to be assembled and taken down in just seconds. It folds down to a compact shape for easy storage and can be played with both inside and outdoors. This foldable play tent is ideal for children aged three years and older. It is made of durable and lightweight material that is designed to stand up to repeated use with ease. Its design functions as a crawl-through exploration tunnel and a small play house that children can sit inside of. It can be set up in the living room as well as the backyard and even on the beach for endless ocean-themed fun. Give your child's imagination a space to run free with this Finding Dory Explore 'N Play tent. Features: -Comforting at night. -Creates a fun, private space. -Durable high-quality material - built to last. -Easily pops open and fastens to the bed in just seconds. -Fits all twin size beds - even bunk beds. -Folds flat for compact storage. Primary Material: -Polyester. Color: -Purple/Turquoise. Dimensions: Overall Height - Top to Bottom: -0.16". Overall Width - Side to Side: -89.75". Overall Depth - Front to Back: -32.63". Overall Product Weight: -0.71 lbs. Creates a Fun & Private Space for Kids to Enjoy! Easily Pops Open and Fastens to the Bed in Just Seconds!